Stumbling upon Sweet Mue is like finding a hidden cookie jar filled with your favorite treats. Tucked away on a quiet side street, this tiny bakery has an adorable storefront that looks like a confection in itself. Upon entering, you're greeted by Müller, the owner, who makes everything herself from scratch. After training at the International Culinary Center in NYC and diligently setting up the shop, Müller opened the doors just a few months ago and is still awaiting neighborhood discovery. Sweet Mue is delightfully delicate and at the same time very modern. Dainty desserts are presented on clear acrylic shelves and appear to be floating in air. 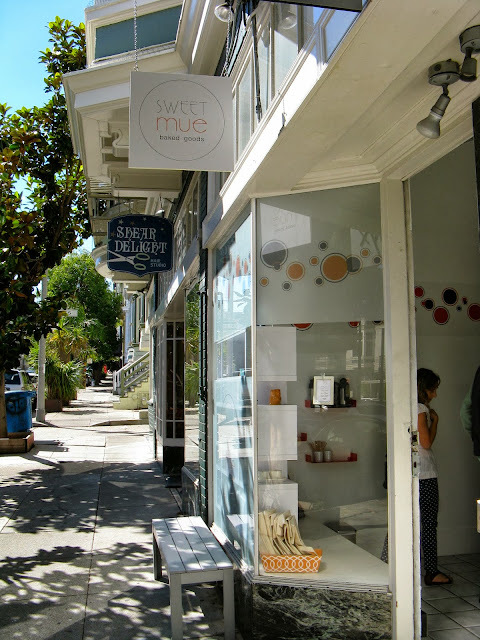 Sweet Mue specializes in classic French pastries with an Asian-inspired flair. I sampled one of the more traditional desserts, a simple raspberry and blueberry tart, which definitely met the standards of fine pâtisserie. The pie crust was flakey and obviously made with real butter, and the pastry cream was smooth, silky and deliciously infused with aromatic vanilla beans. You'll also find other intriguing, unorthodox offerings like cream puffs filled with taro, azuki or coconut, and matcha-flavored browned butter cakes (financiers). Be sure to try a mini tarte Tatin. This irresistible pastry features perfectly caramelized apples and a delicious puff pastry crust. Copyright © 2013-2014, Lisa Alexander. All rights reserved.